I was kindly invited into Jenny Dunbar’s house on a solemn Saturday evening in January to discuss her novel. She is a published author, and her most recent book, Sweet Earth, treats in part of the experiences of men at the Western Front, during the Great War. Speaking for myself, that subject never quite slips my mind now that we are living during the hundred-year centenary – not in winter, at any rate. The remembrance follows one as one’s shadow. But the conversation was certainly not solemn, and well complemented by Ms Dunbar’s most excellent tea and cake. 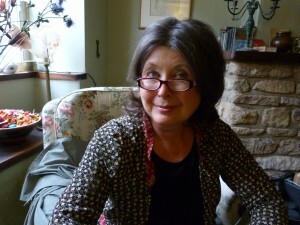 Thinking of the town and readership, I ask her how long had she lived here in Oundle? Fifteen years – she grew up in Peterborough, where I also live. That led us on to talk about change. Is change positive or negative? ‘Well, we have to accept change and make the best out of it, find the positive.’ I asked how a treatment of change had been a feature in her writing: how an event like war alters people’s lives. Certainly this is just. Sweet Earth spans the years between 1916 and 1960, and treats of a great deal of change in the lives of different women. The novel is suffused with a sense of anticipated evanescence from the very beginning, with a tryst between a schoolmistress and a soldier who will certainly soon be called up to the Front. ‘Gradually the outlines of Picardy came into view. The intervening years had not completely altered the lie of the land, which remained more or less recognisable. What had happened upon it though had changed the nature of the visual impression. I ask Ms Dunbar what account she would give of Sweet Earth there and then. ‘It’s about how we are all born in time-slots’, she says, and about ‘women’s lives’. The book ‘was going to be a love-story, and then it grew’. It’s a serious book, and contains much authorial reflection upon the truths conveyed therein. Some of the descriptions are intended ‘to enhance a predicament and not to shock; for example, Lynne’s relationship with the soldier and some of the war images’. From its depiction of rather liberated women, I ask if it is intended to deal with feminism as a theme. The character to whom Mrs Dunbar draws my attention by way of reply is the court-dress maker, who, on seeing an inspiring photograph and singing a rousing hymn is ‘inspired to leave her industrial surroundings and make something of herself’. When I read the book, one of my favourite aspects was its presentation of free spirits in quite an unfree world (and by that, I mean even the modern world). From what we discussed, I would suggest that much of this was intentional: the book ‘crosses class boundaries … about the parallel lives of a group of women, two in France, two in England’. As a work of the arts, it is very holistic: ‘It’s about people’s lives … their losses, their gains, what do they glean’. Writing novels is by no means Ms Dunbar’s only vocation: she began in speech and drama, and her present occupation is, she says, a ‘natural development of my career in the performing arts’. Her experience as an examiner for the English Speaking Board enhanced and encouraged confidence in others through conversation and presentation’. That chimes with my own experience of Sweet Earth – I felt that it was trying to start a discussion with me, and I hope very much that the same is the experience of Ms Dunbar’s readers. It behoves us to remember during this centenary.